Well this dish was a bit fiddlier than my normal efforts. But chicken together with bacon seemed to have potential. No doubt most of you could have done this a lot more neatly – but I can assure you it tasted delicious – even though it looked a bit rough and ready. 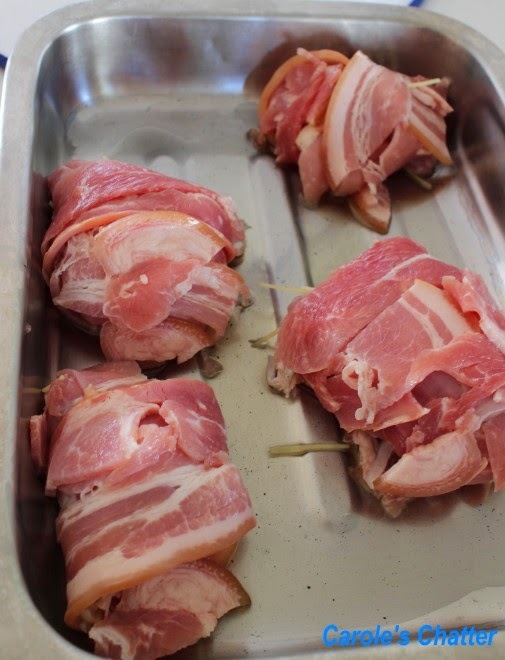 To make Chicken Thighs Wrapped in Bacon I started by cutting up the chicken thighs into suitable sized pieces. In fact, I think mine were a little too big to be wrapped up neatly. I may try this again but using chicken tenders instead of thighs. I seasoned each piece with salt and pepper and put a little parmesan cheese on them and then wrapped the rashers of bacon round them. I then baked them in a moderate oven for 20 minutes or so – checking with a meat thermometer to see when they were cooked. I served them with roast potatoes and a salad. Hi, I came across your blog and I have to say, I love chicken thighs. They are amazing.. I am going to follow you so that I can keep a breast,, no pun intended, of your updates. 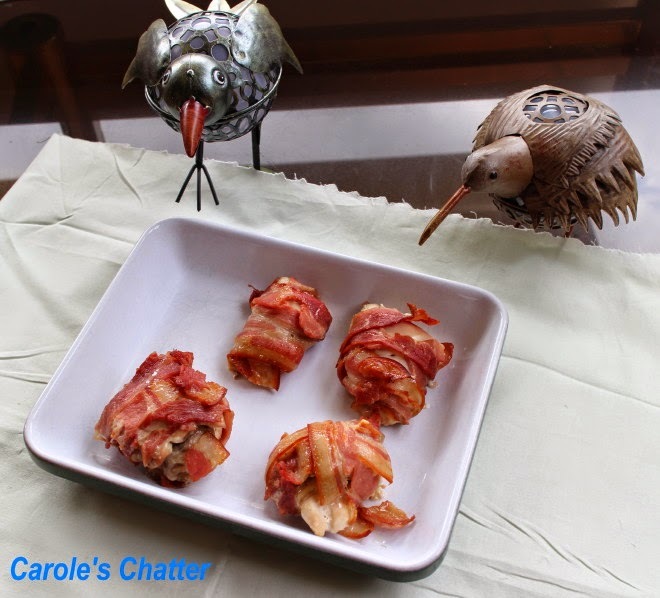 Chicken thighs are one of my favorite chicken parts to grill and with bacon, well isn't everything better with bacon? Looks like an easy, tasty dish. I like the parmesan you added...nice touch! Always fun to have you stop in and link, Carole. I have a few sandwiches I'll link to food on Friday tomorrow. okay you inspired me to go a bit out of the box, not with chicken thighs, but bacon wrapped Cod fillets - they were great and not dry at all! What great flavor your Chicken Thighs will have wrapped in all that wonderful bacon. Thanks so much for sharing your awesome post with Full Plate Thursday and hope you have a great week!